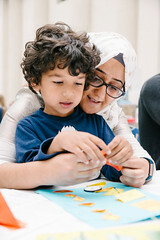 As part of Refugee Week 2017, we are collaborating with the British Museum to bring a special event and celebrate this year’s theme – Shared Future. 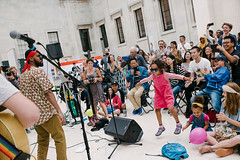 Join us for a rich range of happenings and activities taking place across The British Museum’s Great Court – from music performances, to visual installations, youth workshops and much more. 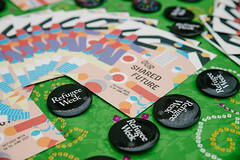 Prompted by this year’s Refugee Week, ‘Our Shared Future’, the programme is curated to encourage full participation. Catering for all ages, it’s a heady mix of theatre, song, making, engaging or simply watching and listening. Dead Reckoning is an ongoing project bearing witness to the thousands of migrants and refugees who have died, and continue to die, attempting to cross the Mediterranean Sea in search of sanctuary and a better life. Each tiny, hand-marbled paper boat is marked with a relationship to another person, a fragile reminder of the individuals caught up in the biggest humanitarian crisis in Europe since World War II. 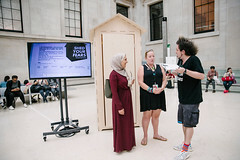 A non-denominational, non-hierarchical booth, into which two people get to confess their fears to each other, privately, anonymously and safely. Designed as a response to recent sociopolitical upheavals, the piece invites participating audiences to share their innermost fears, and by sharing them, hopefully transcending them to the point where they can also share hopes and dreams. 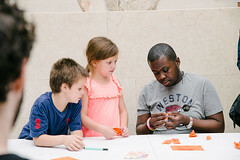 Join tour guides Ameen and Ahmad on a journey through the British Museum’s Islamic World gallery. 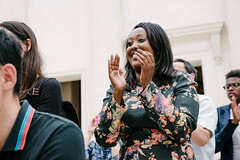 ‘No single story’ started as a pilot tour-guiding programme, in which volunteers from refugee backgrounds were trained to give gallery talks at the Museum. Through selected objects, Ameen and Ahmad will share their personal responses to these beautiful collections. Described as ‘the voice of our generation’ by many young Somalis, Aar Manta is a multi instrumentalist who mixes many musical styles with traditional Somali music. He is working with the UNHCR, traveling to refugee camps in Ethiopia and working with young Somali refugees. Simo Lagnawi is a Moroccan Gnawa master who mixes his Berber origins with deep gnawa grooves. 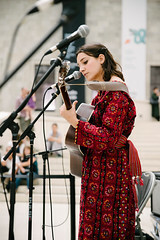 Simo studied with Gnawa masters in Morocco for over twenty years before moving to London in 2008. He is a serial collaborator and is considered UK’s leading guembri musician (camel-skinned bass instrument). 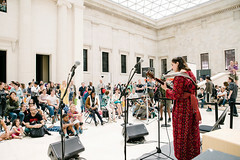 Gnawa music consists of a series of spiritual chants, and Simo’s music transports his audiences with his high-energy acrobatic dancing combined with his strident vocals, krakebs (metal percussion instruments) and guembri playing. What if you had to leave your home, and the life you once knew? Could you take a personal journey, not only leaving your home but leaving yourself to become someone new? Ten true life stories come together in this vibrant piece of the theatre which challenges the stigma associated with displacement. Sink into your seat and watch a series of short and feature-length films, which capture refugee and migration-related stories about ‘rescue at sea’, imagining and re-designing precious neighbourhoods, the resilient power of arts and culture, stepping into the shoes of those who have had to flee, plus the building of new, precarious lives by young refugees. Moving Worlds includes panel discussions with filmmakers, artists, advocates and activists working to create change and build social solidarity across communities and sectors. Screening Where do Art and Migration Meet and They Will Have to Kill Us First. Panel speakers: Johanna Schwartz (Director, They Will Have To Kill Us First); Ahmed Tobasi (Actor); Hassan Abdulrazzak (Writer). This panel will be chaired by Yasmin Fedda, filmmaker and creative producer at Highlights Arts. Screening At Home in the World, Ellis, Home, MOAS Rescue at Sea, My Refugee Story, The Architect and Twinning Towns. Panel speakers: Matthew Saltmarsh (Senior Communications Officer, UNHCR); Laura Padoan (External Relations Officer, UNHCR); Jennifer Laws (Fundraising and Communications Officer, MOAS); Juan delGado (Artist and Filmmaker). This panel will be chaired by Counterpoints Arts Co-Director, Áine O’Brien. The event is free and suitable for all ages.